A Househusband Steps Out On Halloween Night ... Scary! A Househusband Steps Out On Halloween Night … Scary! Corporate Babe and I recently got invited to a good friend’s birthday party. A fancy dress party on Halloween night. A week before the party and on several occasions thereafter, I reminded my wife of the event and that we were required to not only dress up for it, but also find someone to look after the kids for the night. She ignored all of my reminders about the party and the need to go in costume, and didn’t know anyone who could look after the kids in such short notice. Having spent the week reading a book on the laws of the universe by Florence Scovel Shinn, I decided to send out a request to the universe for someone trustworthy and reliable who would be available and willing to look after our kids. A few days before the party, the universe answered my request, and sent us someone trustworthy and reliable who was available and willing to look after our kids. Our good friend GreenGuy (not his real name!) agreed to come over with his young son and stay over on Saturday night to look after all the kids. With one major item now ticked of the list, all we had to do now was think of a suitable costume to wear for the party. I asked my wife what she was going to wear to our friend’s party. The next day I asked her again. Again, she replied that she had no idea. I continued asking her about her costume plans as the event loomed closer, and she continued to pay no mind to it, until just a few hours before we had to leave for the party, when she awoke from a nap on the couch, and then literally pulled a fancy dress costume idea out of a hat and dressed herself up as a magician. Now, the only thing left to work out was my fancy dress costume. I decided I would dress up differently. 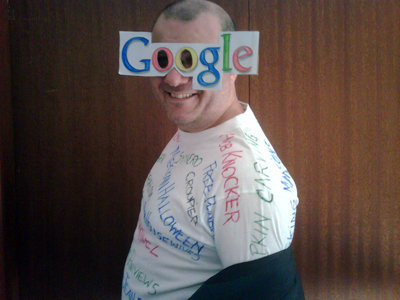 The geekiest fancy dress costume ... ever! Pretty scary for a halloween party huh? As you can see, as far as fancy dress costumes go, it’s not quite a “neo-classic” look , but more of an “seo-classic” look (some might even call it “click chic”)! Visit an op shop and purchase a $5 jacket and a $3 white t-shirt. Next, glue the sheet with the logo onto a piece of cardboard to make a mask for your face (another reason you won’t get sued – no one will know who you are once you put on your disguise!). 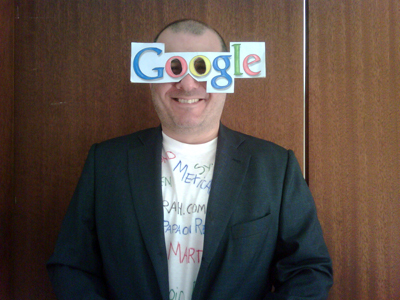 Wearing a Google mask requires vision! Cut out holes in the mask for your eyes (did you notice the ingenious location of the peep holes in my mask?). This is very important as it will allow you to see where you are going (instead of searching blindly – ha ha!). 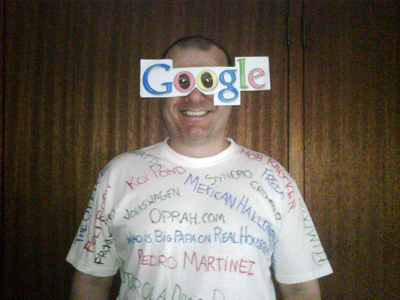 Ensure you have strong backlinks when wearing a search engine disguise - especially if you wear glasses! Print out the most searched for keywords and keyword phrases for that day and write these all over your $3 white t-shirt (if you’re a famous celebrity you can resell said keyword and time-stamped t-shirt later on eBay and make millions of dollars!). If you're a famous celebrity, your unique disguise could fetch millions of $$$ on eBay ... especially if people are searching for YOU on Google! Why only strive to get to the top of Google, when, with a little extra effort you can go completely over the top? Why only drive traffic when you can also stop it dead on it’s tracks. Now that you have the outfit all worked out (no doubt you will look like a most impressive site! ), it’s time to announce yourself to the world. 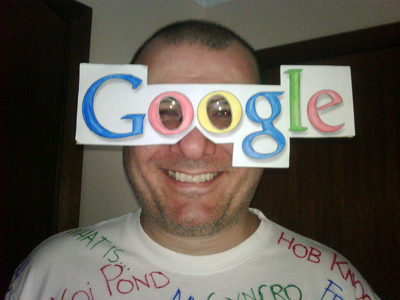 Turn up to the party wearing your Google Goggles, or another similar fancy contraption, (e.g. a “seeing eye-Bing thing”). If you want to make a low-key or “smart casual” entrance, wear the suit jacket over the t-shirt. Otherwise, make a flamboyant entrance. Just remember baby … you’re No#1! 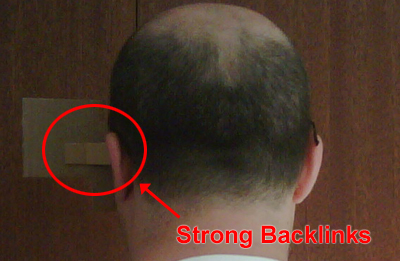 Larry Page, Sergey Brin, or ... The Lazy Househusband? Useful Tip: if, like me, you don’t know what most of those keywords written all over you mean (or wondering how the heck could enough people be searching for stuff like that to make the term appear on the list of “most popular searches”), and you think you might embarrass or offend someone, then write the scarier looking words on the back of your t-shirt and wear the jacket until everyone’s too drunk to care or notice. 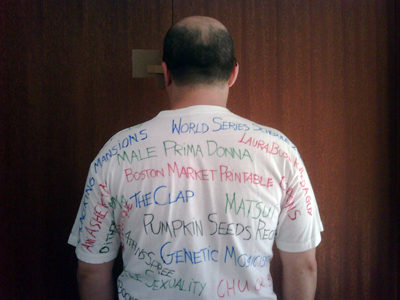 The advantages of wearing your words on your sleeve (or front, or back, or around the collar and under your armpits) is that the words written on your t-shirt will provide you with excellent topics to start a conversation with strangers (or other strange people) at the party. When people ask you what you are supposed to have come dressed as, don’t say anything, just stop smiling and stare at their face until they get it – if they don’t, then move on … they’re probably just freaks just like you! Make an impression at your next party and go from clique to click! You are hilarious! I don’t know how I ended up here but I am glad I did. Keep up the great work! Martin, I loved this. I hope you and Corporate Babe had a great time at the party.